Welcome to the conclusion of our Game In Progress review of Mass Effect: Andromeda. Over the past few weeks, Gameological editor Matt Gerardi has been playing through this latest entry in BioWare’s beloved space-opera series and reviewing it along the way. This final entry covers everything, including the Priority Ops “Journey To Meridian” and “Meridian—A Way Home,” the game’s main ending, and the conclusion of the “Ryder Family Secrets” quest line. Matt is playing as a woman and, for simplicity’s sake, will be referring to Ryder as she/her throughout. “On hold.” It’s a phrase that pops up an alarming number of times throughout Mass Effect: Andromeda. You’ll start out on a new mission, get a tantalizing bit of story, and the next thing you know, you’re being told to put it “on hold” until you reach the next big plot point or unexplored planet and receive an email telling you it’s time to pick things up again. It’s an understandable concession to the game’s multiworld structure, but it’s harmful to the momentum of Andromeda’s smaller narratives, and since it leads to situations where several side stories are all reactivated and dumped on you simultaneously, it plays a big part in its exhausting pacing. Worst of all, Andromeda’s creators seem to have taken their “on hold” device to heart and applied it to many of the game’s most interesting plot threads without telling us. In this case, their continuation doesn’t depend on an in-game email that’s bound to show up within several hours of play. No, they’re on hold until the next Mass Effect game shows up, assuming there is one and it’s a sequel to Andromeda. Given the game’s premise, its overarching story always had to end the way it does. Andromeda is ultimately a game about pioneers, a vast operation that forges forward into an unexplored galaxy and lays the groundwork for a new interstellar society. It’s not much of a spoiler to say that, in the end, Ryder does a good job and her success makes the Heleus Cluster far more inhabitable than it was when the Andromeda Initiative showed up. This is just the beginning of their story, and now they have the unenviable task of readying a handful of wild planets for the influx of cryogenically frozen civilians that will soon be calling them home. It’s easy to imagine a sequel to Andromeda that jumps forward in time, to a point where this interplanetary society has been built up and is suddenly facing some new threat that players have to fend off. And once again, that eye toward the future of this new civilization proves to be at the center of Andromeda’s best moments. The game’s final, most interesting decision is a political one. The bureaucrats that have been annoying you all game (except you, Kesh, you’re cool) task you with choosing an ambassador to represent the planets’ colonists. There are clear benefits to each of the four candidates, but the one that sticks out is the Angaran Moshae, a cultural icon who’s revered by her people. In a game that is literally about invading and colonizing planets, it seems only right that Heleus’ native inhabitants receive this honor and are treated with as much respect as possible. To its credit, Andromeda is aware of the imperialism it implores you to commit, even going so far as to push back against a character who balks at your decision to appoint the Moshae. Since this comes right at the end of the game, we don’t get a chance to see it play out (something that’ll surely be handled in a sequel), but it allows the player to take an introspective look at their priorities and think about what kind of example they want to be setting for the Initiative. But when you look past Andromeda’s main storyline, the threads left hanging—and there are plenty of them—make less sense and are far more damaging to the game as a whole. One of the biggest criticisms lobbed at Andromeda has been that the decisions you make are few in number and inconsequential. That is mostly true, but the clear reason is that these were baked into this game to set up events of future games. This isn’t new for the series. 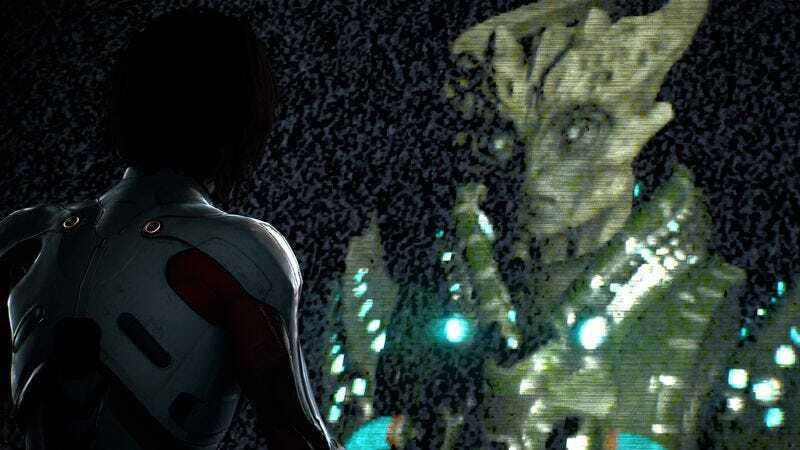 Story bits from the original Mass Effect didn’t pay off until the trilogy’s final hours, when Shepard called in all the friends he made along the way (a trope Andromeda repurposes for its finale). But even in the case of the Rachni Queen, perhaps the most famous decision of this type from the original trilogy, that story had something of an ending. If you freed it, it fled into the wilds of Noveria, promising to sing your praises to its children. If you killed it, well, you killed it. Even with the lingering questions of the “good” choice and the complications the sequels would bring to the “bad” choice, the story was complete. On the other hand, several of Andromeda’s most intriguing plotlines don’t have endings; they just end. Your investigation into the truth behind the Andromeda Initiative’s goals? On hold. The murder of the Initiative’s founder? On hold. The bad guy’s traitorous second-in-command who revealed their plans to you and tried to cut a deal? On hold. The worst of them all is undoubtedly the revelation that Ryder’s mother is still alive and has been stowed away in cryo-sleep this entire time, waiting to be woken up once there’s a cure for her terminal illness. In a moment that is either disturbingly tone deaf or brilliantly self-aware, the Ryder twins gather in front of her cryo-pod and are told that their journeys in Heleus have yielded scientific information that could lead to a cure, but for now they should just “enjoy the fact that she is still alive—and that your accomplishments will one day save her life.” And with that, she’s put on hold until Mass Effect: Andromeda 2. It’s fine to foreshadow and set up sequels or expansions, but Andromeda’s brazen table-setting takes a toll on its own self-contained storytelling. That destructive over-ambition defines Andromeda as a whole. Its desire to be bigger and freer than its predecessors hurt nearly everything about it. It’s why the game’s tedious tasks far outnumber its colorful set pieces. It’s why the facial animations are as laughable as they are. It’s why the script fluctuates between tonally incoherent nonsense and thought-provoking interactions. With this experiment out of the way and the groundwork so thoroughly laid for future stories to shed the excess that holds Andromeda down, the team at BioWare Montreal has a promising path ahead of itself for the sequel this game so desperately wants to prepare you for. That same process worked out pretty well for Mass Effect 2, after all. The gulf in quality between the human and alien crew members really is astounding. After everything was said and done, I’d grown pretty fond of all of them. Jaal’s story was especially well done, and the payoff of his loyalty mission—your visit to his family home—is one of the best scenes in the game. I adored the final missions from a visual standpoint, as they focused almost entirely on that gorgeous Remnant architecture, massive complexes built entirely of pristine, angular metal that’s shot through with neon blues and greens. Romance choice: I accidentally fell into a serious relationship with Peebee after initially agreeing to keep our fling as a casual incident. After her constant denunciation of “strings,” I was really disarmed when we came back from her Loyalty Mission and she had a change of heart. Combat preferences: I only used three of the four favorite slots. My primary build was a Vanguard who mostly dealt in shotguns, Charge, Overload, and Nova. My second was an Infiltrator with Turbocharge, Incinerate, and Concussive Shot. And my third was an Engineer with Overload, Assault Turret, and Remnant VI. That was a fun one.